Classic attractions have returned to Disneyland® Park with the recent official reopening of the Disneyland Railroad and Rivers of America attractions. For the very first time, the Disneyland Railroad now makes a left-hand turn as it circles Disneyland Park, and Walt Disney’s legendary dioramas of the Grand Canyon and Primeval World have been carefully restored to their original splendor, with a bit of new magic added to both! Plus, the classic Rivers of America attractions have also now reopened, starting with Pirate’s Lair on Tom Sawyer Island last month, followed by Mark Twain Riverboat, Sailing Ship Columbia and Davy Crockett Explorer Canoes last week. For decades, guests have traveled the landscapes inspired by four of America’s majestic rivers: the Mississippi, the Columbia, the Missouri and the Rio Grande; each carefully recreated, complete with indigenous rock formations, natural forests and wildlife. The return of these watercraft will bring even more breathtaking views for guests to discover, including an enhanced adventure featuring the new Columbia Gorge section, highlighted by five picturesque waterfalls. Halloween Time at the Disneyland® Resort is growing with more frightful fun! This year, you can get into the spooky spirit at Disney California Adventure® Park, with all-new ghoulish delights at Cars Land and on Buena Vista Street. 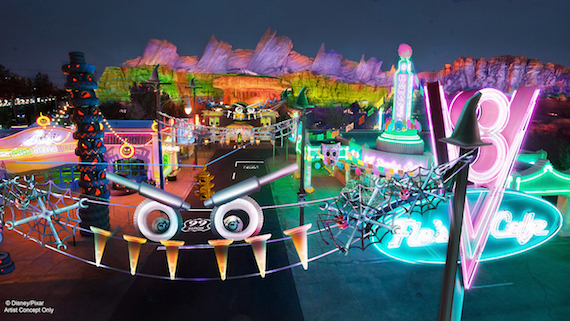 Cars Land will get all gussied up with four-wheeled frights as the citizens of Radiator Springs don their Halloween costumes and decorate their homes to celebrate Haul-O-Ween. From Fillmore’s Jack-Oil Lanterns and Flo’s Spider-Car to Witchy Miss Lizzie’s shop, everybody’s doing all they can to turn Radiator Springs into Radiator Screams! 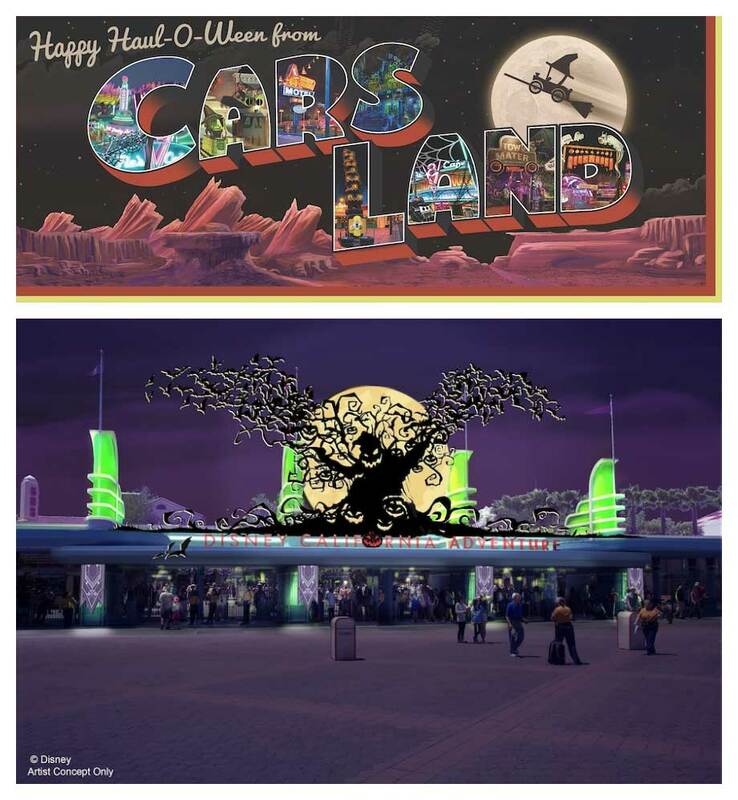 Guests will experience some of their favorite Cars Land attractions in new ways as Mater’s Junkyard Jamboree becomes Mater’s Graveyard JamBOOree and Luigi’s Rollickin’ Roadsters transforms into Luigi’s Honkin’ Haul-O-Ween. On Buena Vista Street, a spell will be cast with new Halloween decor all along this stylish thoroughfare inspired by “Tim Burton’s The Nightmare Before Christmas.” Oogie Boogie has risen from the shadows to take over Disney California Adventure park, and his oversized silhouette beckons guests through the main entrance as a swarm of bats encircle Carthay Circle Theatre. At Disneyland® Park, the famous Pumpkin Festival will greet Guests as they make their way down Main Street, U.S.A., on their way to the eerily magical Haunted Mansion Holiday and Space Mountain Ghost Galaxy attractions. Also at Disneyland® Park, the popular Mickey’s Halloween Party returns! Tickets to the private Mickey’s Halloween Party, featuring special entertainment and trick-or-treating at locations throughout Disneyland Park, go on sale July 17 for Annual Passholders, Disney Vacation Club members and Disney Visa Card holders; and July 24 for the general public. Mickey’s Halloween Party takes place on Sept. 20, 22, 25, 27, 29, Oct. 3, 6, 10, 13, 17, 20, 24, 27 and 31, 2017. New this year for Mickey’s Halloween Party Guests, Disney California Adventure Park will be featured for the first time as part of the pre-party mix-in. Early arrivals will be able to visit both theme parks for three hours prior to the party launch in Disneyland Park. Also new this year, admission to Mickey’s Halloween Party will include complimentary Disney PhotoPass. Mickey’s Halloween Party features special entertainment, including Disney characters – Disney villains as well as Mickey Mouse and friends — and the Cadaver Dans ghostly quartet performing on the Rivers of America. An extra special treat is the “Halloween Screams” fireworks spectacular, a Mickey’s Halloween Party tradition presented exclusively for party guests. Also exclusive to Mickey’s Halloween Party is the “Frightfully Fun Parade,” led by The Headless Horseman of Sleepy Hollow (from the Disney animated classic “The Adventures of Ichabod and Mr. Toad”). Mickey’s Halloween Party tickets are subject to availability and are valid only for specific event dates and hours. Space is limited. Advanced purchase savings available only for select party nights and only until one day prior to applicable event date. Limit eight (8) tickets per person, per event date. Tickets are nonrefundable and may not be resold. May not be combined with other discounts. Costumes subject to Disney guidelines at https://disneyland.disney.go.com/events-tours/mickeys-halloween-party/ and should not be obstructive or offensive. Ages 2 and under: no ticket required. Entertainment may be cancelled due to inclement weather or otherwise. Subject to restrictions and change without notice. Disney PhotoPass service is subject to the PhotoPass terms found in https://disneyland.disney.go.com/photopass-terms-conditions/. Online registration required. Disney PhotoPass Photos captured during the Mickey’s Halloween Party must be linked to your Disney account and may be downloaded pursuant to the expiration policy at https://disneyland.disney.go.com/photopass-expiration-policy/. Not responsible for missing, lost or damaged photos. Downloads are restricted to personal use by Disney account holder only and may not be used for a commercial purpose. Subject to restrictions and change without notice. ‘Fantasmic!’ Returns to Disneyland Park this Summer! Twenty-five years ago, the Rivers of America at Disneyland® Park became the stage for the colorful tableau of Mickey Mouse’s imagination with the opening of the classic nighttime spectacular, “Fantasmic!” When it returns to Disneyland Park this summer, “Fantasmic!” will still be the treasured Disneyland Park experience guests have loved for 25 years – complete with its original fanfare and theme song – but all taken to brilliant new heights! The official opening date for Fantasmic is still to come. Last weekend, “Guardians of the Galaxy: Vol. 2” blasted its way to the top of the box office charts, and now the cosmic heroes are getting ready to land at Disney California Adventure® Park at Disneyland® Resort. The action kicks off in a big way May 27, 2017 with the opening of the all-new Guardians of the Galaxy – Mission: BREAKOUT! and the launch of Summer of Heroes which includes Super Hero fun for everyone! During “Guardians of the Galaxy: Awesome Dance Off!” Star-Lord and Gamora return to the Collector’s Fortress to retrieve a special artifact … Star-Lord’s precious boom box. Looking to avoid discovery, they ignite a lively party vibe, enlisting everyone gathered around to help out and show off favorite dance moves in a rockin’ Dance Off. And for the first time, you can encounter the one-and-only Groot. He arrives on the scene just as the Dance Off is wrapping up, but is happy to stay for a while and visit with everyone as Star-Lord and Gamora make their escape. Summer of Heroes also brings more excitement across Hollywood Land, including the Avengers Training Initiative featuring Black Widow and Hawkeye and heroic encounters with Black Widow, Captain America and your friendly neighborhood Spider-Man. This summer is going to be epic! Disney California Adventure® Park at Disneyland® Resort will soon be the destination for adventure, intrigue and triumph as recruits from around the world join forces with legendary Super Heroes in an ever-expanding universe of stories that will grow even bigger over time. This summer, Disney is kicking off the action with the May 27 grand opening of the thrilling, rocking attraction, Guardians of the Galaxy – Mission: BREAKOUT! This new adventure blasts guests straight into the “Guardians of the Galaxy” story for the first time ever, alongside characters from the blockbuster films and comics. As guests help Rocket bust his pals out of the Collector’s Fortress, they’ll experience randomized ride experiences complete with all-new visual and audio effects and music inspired by the popular film soundtracks. Guests will never know which adventure they’ll get! There will be even more ways to step into Super Hero stories with Summer of Heroes, May 27 through Sept.10, 2017. Guests can answer the call for this limited-time celebration as they join the Avengers and the Guardians of the Galaxy for all-new epic experiences. Guardians of the Galaxy: Awesome Dance Off! – Guests may run into the Guardians of the Galaxy on their way to the Milano, with Star-Lord firing up his old-school boom box to get the party started. Gamora may prefer to stand back and observe, but everyone else is bound to get in the groove and show off their moves during this awesome rock ‘n’ roll bash! Super Hero Encounters – For the first time, citizens of Earth will come face-to-face with Groot, one of the Guardians of the Galaxy! Guests can also step up to meet the First Avenger, Captain America, along with everyone’s favorite web slinger, your friendly neighborhood Spider-Man. Grab a Piece (or Bite) of the Action – Special themed merchandise and food will be available throughout Hollywood Land. The summer brings even more to get excited about over at Disneyland park as classic favorites return with the reopening of the Disneyland Railroad and Rivers of America attractions, with the “Fantasmic!” nighttime spectacular returning later in the summer. Let your Super Hero out! Throughout the years, I have been lucky enough to stay in all three Disneyland Resort Hotels. If you are looking for that extra special something on your next Disneyland vacation, this is it! Below you will find a list of the many benefits of staying at a Disneyland Resort Hotel. Trust me when I say, Disneyland can get more magical than it already is, and staying at one of these hotels can make a big difference! 1. Guests have quick and easy access to the Disneyland parks and Downtown Disney – they are literally steps away! 2. Disneyland Resorts are the top rated hotels in the Anaheim area – All Disney Resorts are AAA Diamond rated. 3. Resort rooms are much nicer and more spacious than the surrounding hotels. 4. You can request a wake up call from your favorite Disney characters. 5. Step into the storytelling and magic of Disney everywhere you go – Disney touches are in your rooms, the lobby, pool area, restaurants, even in the carpet and wall paper! You will be completely immersed in the magic! 6. Get Disney’s legendary quality services and help 24 hours a day – If something goes wrong or you have questions, a Disney cast member will be right there to help. Disney has very high standards when hiring their cast members. They are polite and always willing to help. They will go the extra mile! 7. Each day guests have the opportunity to take advantage of the Early Morning Extra Hour into the parks. So, with a five day park ticket guests will be able to enter into the parks an hour before the parks open to the general public for five days. This is particularly nice for Disney’s California Adventure Park. As you may know, Radiator Springs Racers attraction is extremely popular and the line is always long. Having the extra hour in the morning not only saves you time, but within the first hour you can ride this attraction several times. We usually ride it three times during this hour. The same can be true for any of your favorite attractions at either park. 8. Resort pools are larger and are nicer than the surrounding area hotels, plus, each resort includes fun slides. 9. Each of the Disney Resorts have several activities that take place every day that the whole family can enjoy including: arts and crafts, special showings of Disney films, pool parties, computer games, and dinner at the fun-filled child activity center. You don’t get anything like this at the other hotels. 10. Use your “Key to the Magic” card (room key) to charge meals and merchandise purchases right to your room. 11. Have merchandise delivered right to your hotel with Package Express Services at no extra charge. 12. If you’re staying at Disney’s Grand Californian Hotel & Spa you have a private entrance into Disney’s California Adventure. In the afternoon, only Disney Resort guests can use this entrance. 13. When staying at one of the Disney hotels you can enjoy many of the amenities from all three hotels including the Mandara Spa at the Disney’s Grand Californian Hotel & Spa. 14. Guests have access to special tours available exclusively to Disney Resort guests (Experiences change pretty regularly. Ask the front desk when you arrive what they are during your stay). 15. Music from the fireworks and/or World of Color can be listened to in each guest room. If your room is facing the parks, you can watch the shows from your hotel. If you are planning a trip to Disneyland, please contact me for more information and deals.